There is no shortage of articles out there - in newspapers, magazines, parenting books, and empirical journals - that extol the virtues of helping children fail with pride. 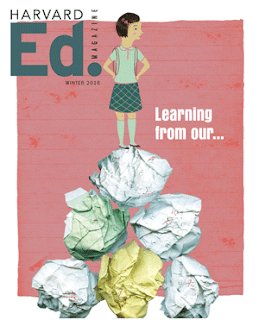 Most recently, Ed., the magazine of the Harvard Graduate School of Education, published a lengthy, informative piece about what teachers around the country are doing to introduce failure and mistakes into their classroom culture. As a Learning Specialist at The Yellin Center, I find myself discussing the idea with parents on a regular basis: kids need to see the importance of not getting it right the first time. The concept matches up with Dr. Carol Dweck’s theory of mindset, which we introduced in a 2011 blog post. I even blogged about the importance of failure last fall. Despite the ongoing coverage on our blog and in the wider media universe, one big question remains. What about kids who have already learned to fear failure? How do we help rehabilitate their sense of try-try-again when they are already fearful of taking on big challenges? From a psychologist’s standpoint, I’d like to know the tools for reconditioning this aversion to failure out of our older students, and instilling in them a new appreciation for the learning curve. This common situation is often brought up by parents who are looking for tips and tricks to reteach their children (and themselves) how to make mistakes. One very powerful example of the benefits of failure continues to pop up in articles and books – learning to walk. Babies spend quite a bit of time and energy pulling themselves up, only to fall back down. And once they’ve finally got standing under their belt, they are even more motivated to continue failing at walking. That is, until they succeed, as they all do, eventually. Babies don’t know that they’re supposed to be good at everything the first time; it seems like we’re hard-wired to push past our failures until we’ve accomplished our goal. If toddlers gave up trying to speak every time their words were misunderstood, we’d all be mute. Sharing this story with our middle- and high-schoolers can be one step in helping them rethink hardship. One story, however, is not the cure-all. Many schools are already starting to incorporate a love of mistakes into their curriculum and climate, but it’s important for families to work together with schools so that students are surrounded by a supportive environment that values mastery over, for example, how something looks on a college application. There are other strategies for parents to work on at home while classrooms are being slowly transformed into failure-friendly settings. First, be a positive role model. Consider the language you use about your own abilities, and introduce some new, visible challenges into your own life that your kids can watch you learn from. Even better is to involve them in the process. Maybe this means trying that really difficult recipe you’ve been putting off for years because you know it’s going to be a mess the first time around, or maybe you’ve always wanted to learn how to knit but you’ve made it known that you’re just not good with your hands. Now is your chance to model a new way of thinking about “ability” and growth. Give that recipe or that new hat a go, and laugh about it with your kids afterwards. And don’t forget to let them know how good you feel that you took a risk, and how excited you are to keep trying, because you know that deliberate practice is way more important than “talent.” Check out this episode of Freakonomics for more information about using deliberate practice to learn a new skill outside your comfort zone. Once you’ve modeled the behavior, you can move on to offering the experience to your tweens and teens at home. It may be too much pressure for a middle- or high-schooler to give up the drive for perfection at school just yet, but any low-risk activity is a great starting point. This might be a really challenging video game, a new hobby, or a strenuous group activity like rock-climbing (there’s a reason we wear harnesses, right?). Paired with the right casual conversation about taking risks and messing up, any activity can jump start a child’s appreciation for falling off the proverbial horse. These activities, which don’t come with the same baggage as an upcoming math exam or the SAT, allow parents to embed little life lessons and healthier ways of thinking into conversation. While you and your kids are working on making mistakes at home, it’s important to keep the conversation going with their teachers. Are students allowed to rewrite essays and correct their exams? Do teachers encourage students to take risks or, conversely, just to get high marks? Have teachers introduced the students to the language around mindset, grit, and failure? Odds are, your child’s school is already working to make failure an important and stress-free part of the learning process. Teachers and other school professionals could be a great resource for parents to learn more about how to support their children’s development, and open communication between parents and teachers is beneficial for everyone involved. "Mistakes Were Made" in the Harvard Ed. magazine, referenced at the beginning of this post.